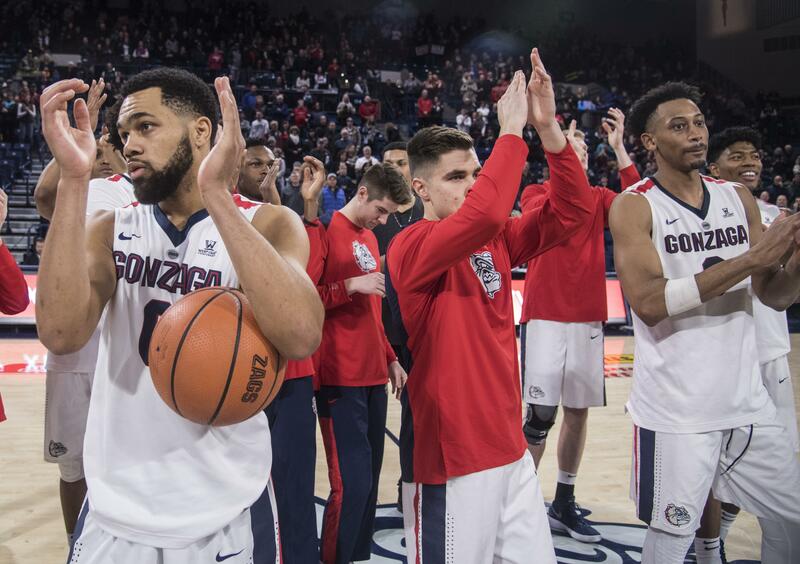 That was good news for Gonzaga, which rang up two home wins and climbed from No. 9 into a share of No. 6 with Texas Tech, which was seventh last week. The Zags (25-4) and Red Raiders (22-5) picked up 1,206 votes. Gonzaga’s nine-game winning streak has resulted in a rise of nine spots in the poll in the last month. The top four of Virginia, Michigan State, Villanova and Xavier stayed the same. Virginia received 45 first-place votes, 12 more than last week. Villanova, an 88-72 winner over Gonzaga in December, thumped Xavier on Saturday but it didn’t affect the Muskateers’ ranking. Duke soared up seven positions to No. 5 after a 2-0 week. Kansas, Purdue and North Carolina rounded out the top 10 below Gonzaga and Texas Tech. Ohio State lost a pair of games and plunged eight spots to No. 16. Clemson went 0-2 and dropped from 11th to 15th. Saint Mary’s (25-4), which has split games with GU, plunged seven spots to No. 22 following a loss to San Francisco. The Gaels have dropped 11 positions in two weeks. Gonzaga is solo sixth in the USA Today rankings. Michigan State hung on to No. 1 by just nine points over Virginia. Villanova, Xavier and Duke complete the top five. The Zags slipped from 36th to 43rd in NCAA RPI because their wins came against Loyola Marymount and Pepperdine, two teams in the RPI’s bottom 75. Saint Mary’s is No. 32. GU’s ranking is pretty close to its projected seeding by a trio of bracketologists. The Zags are a five seed in Foxsports.com’s and ESPN.com’s bracket. They’re a four, according to CBSsports.com. Poll rankings don’t appear on team sheets considered by the selection committee. No. 24 Middle Tennessee State, led by former Idaho coach Kermit Davis, cracked the AP rankings for the first time in program history. Houston, piloted by former Washington State coach Kelvin Sampson, entered the poll at No. 23 after upsetting Cincinnati. Creighton, a 91-74 loser to Gonzaga, is receiving votes. Published: Feb. 19, 2018, 9:34 a.m. Updated: Feb. 19, 2018, 10:42 a.m.